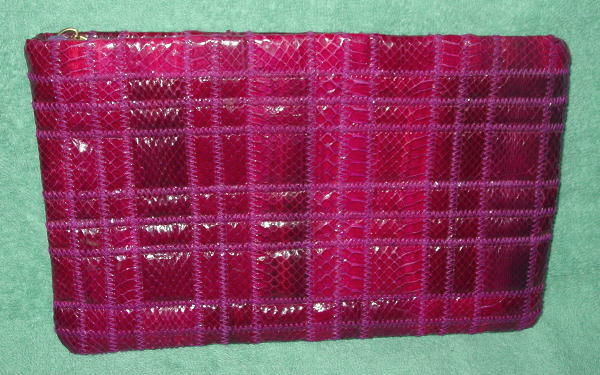 This snakeskin clutch purse can be worn from daytime into evening and is by Albi. It was made in Hong Kong. There are two gold-tone metal loops on either end of the zipper so you can add a link chain (handle or shoulder strap length) if you wanted. It's in a light magenta-red, dark magenta, grape-wine, and light magenta. 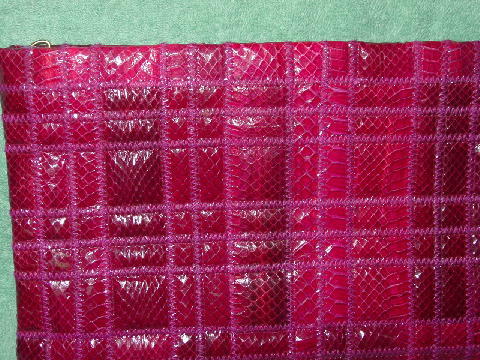 The surface is covered in uniform patches of the various colors of snakeskin sewn together by pinkish-magenta color thread. The interior has a thick black vinyl lining and it has a large interior zippered compartment. It has an eyecatching color.